Guinea fowl breast, foie gras, potatoes, meat broth, salt, pepper, oil. Place the guinea fowl breasts together and fill with the stuffing we will have prepared with the foie. Make mashed potato and add olive oil. 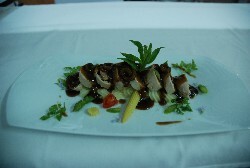 Present the dish making a bed with the mashed potato, fresh vegetables and place the filleted breast on top, add sauce and decorate with aromatic herbs.